We expect to see the Microsoft Lumia 950 and Microsoft Lumia 950 XL unveiled on October 6th during a media event in New York City. Also rumored to be making an appearance that day, is the Surface Pro 4 and the sequel to the Microsoft Band. 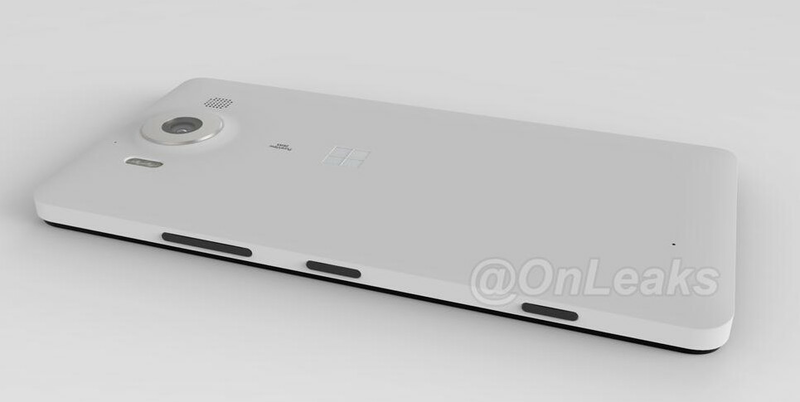 A render of the Lumia 950 XL surfaced earlier today, confirming its 5.7-inch display. Now, a new render of the Microsoft Lumia 950 has appeared. This is a CAD render, used by the company to help it manufacture the phone, and by case makers to make sure that their cases fit the new model. The render shows that the Microsoft logo is embossed on the back of the device. Also on back is the PureView Zeiss label for the rear camera. Earlier this month, tipster Evan Blass (once known as @evleaks), said that the new Lumia models would be launched on October 10th, just a few days after the unveiling. Microsoft has plenty of competition it will face during the quarter. The Apple iPhone 6s and Apple iPhone 6s Plus will be in demand, and the Android powered BlackBerry Priv could be in the marketplace as soon as November. Don't forget the two new Nexus models that are being unveiled on Tuesday, the Nexus 5X and Nexus 6p. And while it seems more like a mid-ranger than a top-shelf model, HTC is said to be preparing an expensive marketing campaign for the HTC One A9. Will Microsoft be able to get consumers to notice its new handsets in a crowded marketplace? That is the big question lingering over the company's phone division right now. Please tell me you're not the same guy as that mentally retarded QWERTY user. lol,.no I'm not. dont know how he could possibly know how to type. I just wanted the speaker at the bottom end or front. Having it on the side is bad enough (lookin' at you, Samsung and Apple), but I really don't understand how some flagships in 2015 still have speakers on the back (lookin' at you, LG and apparently Microsoft). What possible benefit does that provide? Actually having a front firing speaker is not that different from speaker on the back. It can get muffled when you put your phone in your jeans/trousers. Looks better than the render(?) shown on the article where the DerekJeter user got [b]itch-slapped by Penny (sorry, i couldn't remember the name of that article). The camera ring looks ridiculous except if there is a purpose in that. Is that chrome painted plastic or metal? Why does this have to have a 2k screen...just leave it to the 950XL. Guess they are really saving their true premium lineup for later starting with the first Surface phone? This looks terribly cheap... and it isn't the choice of polycarbonate that's the problem. The Sony Xperia Z5 Compact looks way more premium than this. It's a slightly altered Lumia 640. You don't put Mustang/Corvette specs in a Focus/Malibu and you shouldn't do this for phones either. My only great guess is that the prices will be very tempting for what you're getting. Still very much interested in these devices after a year off from Windows Phone though. If the Z5 gets another chance with T-Mobile, Microsoft can forget it though. Uh, yes you can. I've shoehorned Pintos with 351 Windsors, Vegas with Grand National twin-turbo V-6s and a Chevette with a 350. Upgrade the brakes and suspensions and you have a fun ride. I'm just waiting for 3 things: The official launch, reviews and the price. I am looking forward 950 will compete with xperia z5 and s6 edge camera tests. looks good. better than the 950XL even. Looks very much like a Nexus 5X or an HTC One X. I don't mind the look of the device at all. Windows Phone 10 is the culprit though. I will take WM10 over ios and android anyday! Who the hell wants a Windows Phony? Trolll somewhere else! I see many people leaving Android and ios in favor of Windows! WM10 will grow bigger and bigger! Same question people have been asking apple fans. Like I said before the 950XL looks like my Verizon Nokia designed 928 that has more curved corners. Folks Nokia' former employees design these new Windows 10 ready Mobile smart phones so do not expect them to look much different from what they designed for Nokia. it would be nice if they made a Surface business smart phone that's made of metal that looks much like Nokia's "N8"